While choices are great, they can also be overwhelming if you don’t have a basic understanding of the products and their differences. 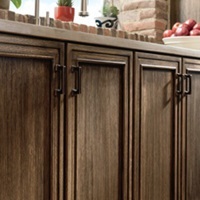 We’ve gathered some information on key product elements to give you an overview of cabinetry details. As you begin to look at different cabinet lines, you’ll notice that they are usually classified into categories such as Wall, Tall, Base, Vanity, Other Room and Accessories. These categories are intended to provide quick reference points to help you navigate the breadth of the lines and number of options that are available to you. 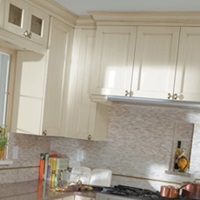 Base cabinets are sometimes called lower cabinets. They are strong and sturdy, providing a base for heavy countertops, or used to create the perfect kitchen island or window seating. In a bathroom, base cabinets provide the foundation for a vanity or can be used for storage and organization of everyday essentials. Cabinet doors make a big impression in any remodeled room, taking up a significant part of the visual appeal of the space, while defining your personal style. They are available with various center panel styles, as well as overlay and inset versions. 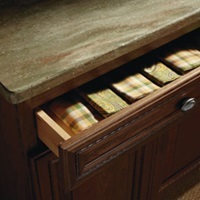 Cabinet drawers, among the most versatile cabinetry items in your home, are constructed in many different types to suit the needs of your remodel. Tall cabinets, also called pantry cabinets or utility cabinets, create bountiful storage and a dramatic vertical look in a space. 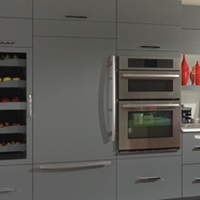 Typical tall cabinets will range in height from 84 inches to 96 inches as one unit. Wall cabinets, sometimes called wall-mounted or upper cabinets, refer to cabinets that are hung on a wall, as opposed to resting on the floor. 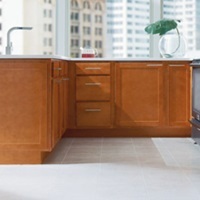 A mainstay for remodeling with cabinetry, they add beauty and functionality to the kitchen, bath, laundry or family room.